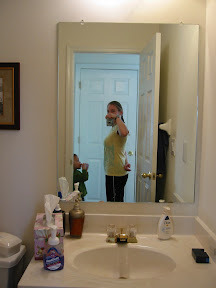 I celebrated the big pregnancy halfway mark (20 weeks) with a nice ride on the trainer today. It was the first time on the bike in over 10 weeks, which just seems insane to me, but it is what it is! I felt great, just did some spinning and now I ready to tackle the day! I love 2nd trimester, I finally have some energy back! And for everyone who has been nice enough to say that I don't have much of a belly, here is a picture from after my ride... cycling clothes have a way of really showing it! What a difference a month makes! 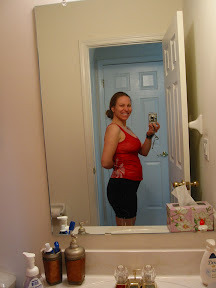 Here is the 16 week "belly shot". um, yeah....still not much of a belly!! !